Bayern Munich and Arsenal renew their rivalry on the Bundesliga World Tour on Wednesday. Armed with summer signings James Rodriguez and Corentin Tolisso, as well as an unblemished recent copy book against the North London club, the Bavarians have every reason to be confident. The two have collided frequently in recent seasons, but it’s the German record champions who have come off better, winning their last three clashes in the Champions League with an aggregate score of 15-3! bundesliga.com takes a look at five reasons why Bayern should beat Arsenal…AGAIN! A club icon, Thomas Müller graduated from the club’s Säbener Strasse youth academy in 2008, and has been putting what he learned into devastating practice ever since. Arsenal can vouch for that, having conceded five goals and one assist to Müller in seven face-to-face meetings. Questions over the Germany forward’s place in the Bayern starting XI have come into sharper focus recently with James — the Colombia megastar signed on a two-year loan deal from Real Madrid — occupying a similar position. However, his record against them is likely to ensure Müller will be let loose to terrorise the Gunners once again. England may have won the World Cup in 1966, but Germany are currently wearing their fourth global crown after triumphing in Brazil in 2014, and they added the Confederations Cup and European Under-21 Championship in recent weeks to boot. Bayern — Germany’s record champions with 26 Bundesliga triumphs — embody the country’s winning-is-the-only-thing-that-matters mentality. Carlo Ancelotti’s side have won seven of their 12 previous meetings with Arsenal, losing only three. Bayern’s stinging 10-2 aggregate win in the clubs’ UEFA Champions League Last 16 tie last season must still be painfully vivid in Arsenal fans’ minds. Arsenal may take some consolation from knowing they are not the only ones to suffer at the feet of Robert Lewandowski, but suffer they have! The prolific Poland international has found the net on three occasions in his last four encounters with the English club. Strange, perhaps, that a team nicknamed the Gunners have found not found an answer to silencing one of Europe’s premier marksmen. In the battle between two of the game’s greatest exponents of the coaching art, the Bayern boss has a happy knack of outwitting his rival, Arsene Wenger. Though he lost out to the French tactician while at AC Milan, Ancelotti’s time at Chelsea was bountiful for him, and almost barren for his opposite number. While at Stamford Bridge he — ironically — frequently gave Wenger the blues, recording three wins at the cost of just a single reverse. Last season’s resounding double over Wenger took his record to five wins and just two losses in eight head-to-head duels in the dug-out. Arsenal have hit hard in the transfer market by bringing in Sead Kolasinac and Alexandre Lacazette, breaking their club record to tempt the France international across the Channel. Bayern, though, have matched their rivals’ efforts, and then upped the ante. 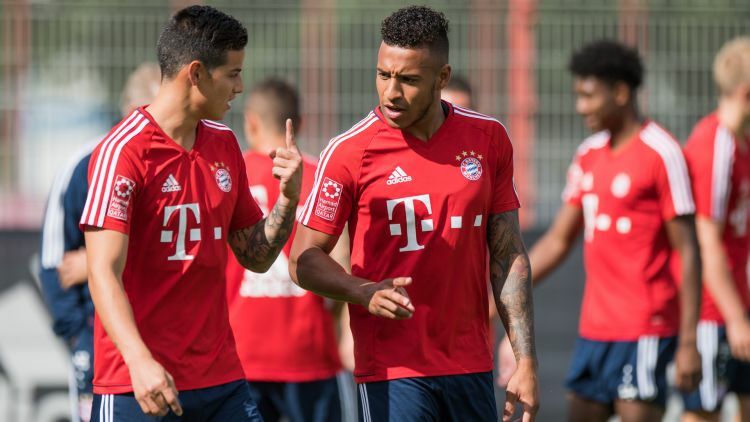 Though new arrivals Serge Gnabry, who will join Hoffenheim on loan, Sebastian Rudy and Niklas Süle are enjoying an extended summer break after successful summers at international level, James and Bayern’s own record signing Tolisso — a former team-mate of Lacazette at Lyon — surely give the German giants the Shang-high hand in China.